Massage therapy is one of the facets of care provided by our Registered Massage Therapists at A Body in Motion! Our highly-educated and experienced RMTs work with illness, injury and disability in diverse and broad patient populations. They are a part of our team of primary health care professionals that focus on disorders of the musculoskeletal and related systems. Massage therapy is the manipulation of soft-tissues of the body including muscle, connective tissues, tendons, ligaments and joints. Massage therapy is a clinically-based healthcare option that helps alleviate the discomfort associated with everyday and occupational stresses, muscular over-use, injury, and many acute and chronic pain conditions. There is a growing body of research supporting massage therapy as an evidence-based therapeutic modality and encouraging massage therapy to be used in the best management of patients experiencing pain, injury and overall deconditioning. Working as a collective team, our physiotherapists and massage therapists have the ability to communicate with each other regarding mutual clients to ensure these clients receive the best and most efficient care. It is widely acknowledged that a massage feels good, but how does it help treat various conditions? Massage therapy works through multiple factors that are both physiological and psychological. There is a direct effect from the manipulation of the affected soft-tissues by inducing a body response which will relax tissue, improve blood flow and improve the healing of damaged tissue. As well, there is an indirect effect from therapeutic touch which will stimulate the nervous system which then reacts to reduce harmful biochemicals related to stress, pain, and mood. What Conditions Might Benefit From Massage Therapy? Massage therapy is also remarkably effective when used as part of a preventative program. Some examples of enhancing general wellness may include pre and post-natal care (pregnancy), infant massage, stress management, sports training, injury prevention and performance enhancement. Everyone!! From infants to geriatric patients! There is growing research that massage therapy can benefit a huge range of conditions with little to no adverse outcomes. All massage therapists at ABIM are highly educated Registered Massage Therapists that are eager to work with you through your concerns. 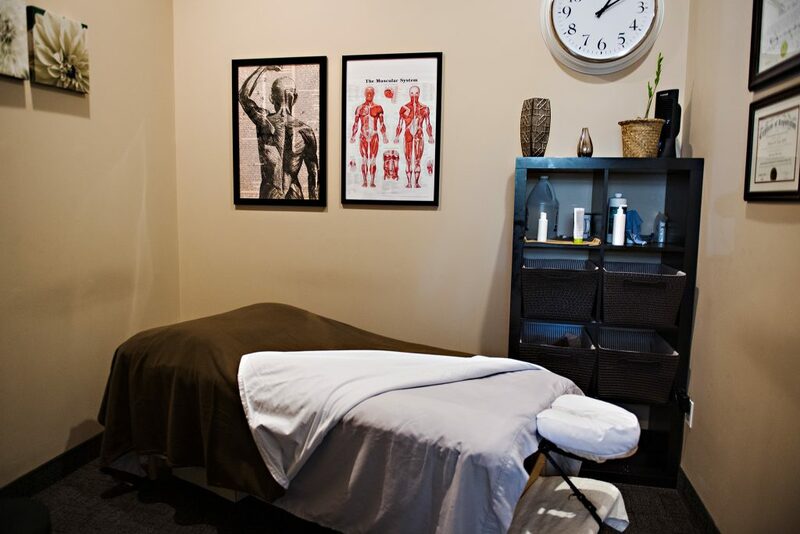 When you begin your treatment at A Body In Motion, you will meet with one of our massage therapists and answer a few questions pertaining to your health history. These questions will help to direct your best course of treatment. Your RMT may perform a few clinical tests to assess and determine the potential root cause of your concerns. This is important because the problem area is not always where the pain is!! Once you and your therapist have determined a treatment plan, your RMT will allow you time to get comfortable on the table before treatment begins! Massage therapists often work directly on the skin, removing clothing barriers, which allows them to adequately assess and feel the soft-tissues beneath their hands. However, this is not always necessary! Depending on your condition, your treatment plan and use of the most effective techniques to assist, it may be better for your therapist to work through your clothing or your RMT may ask you to wear loose fitting clothing. It is important that you are very comfortable throughout your treatment and your RMT will ensure that this is always the case. Your therapist will ensure maximum privacy during the treatment using sheets and educated draping techniques to maintain your comfort level as this is always our top priority! Matrix Repatterning is a new way of understanding, objectively assessing and gently restoring balance within the body. It is a clinically-proven form of manual therapy based on sound scientific principles, utilized around the world by many health-care professionals. Matrix Repatterning restores structural balance, eliminates pain and improves overall health by resolving the problem at the source – literally at the cellular and molecular levels. Each and every cell in our bodies is linked to all other cells by molecular strands. These strands make up a strong and flexible framework, much like a highway, and provide signals which are essential for optimal health. If there is a disruption in the communication within this framework, for example, with injury, cellular communication is disrupted and a focal area of tension arises, resulting in pain and health problems. What makes Matrix Repatterning different is that Certified Matrix Repatterning Practitioners are able to precisely locate the source of the problem (primary restrictions), due to an electronic change in the cell structure, which accompanies the injury. Once this is identified, treatment, using gentle manual pressure is used to encourage the structures contributing to the condition, to return to a normal state of tone. By systematically releasing all of the layers of injury, which have accumulated over a lifetime, Matrix Repatterning can allow the entire body to be restored (repatterned) to optimal, pain-free function. To learn more about Matrix Repatterning, please visit the website matrixrepatterning.com or send us a message!